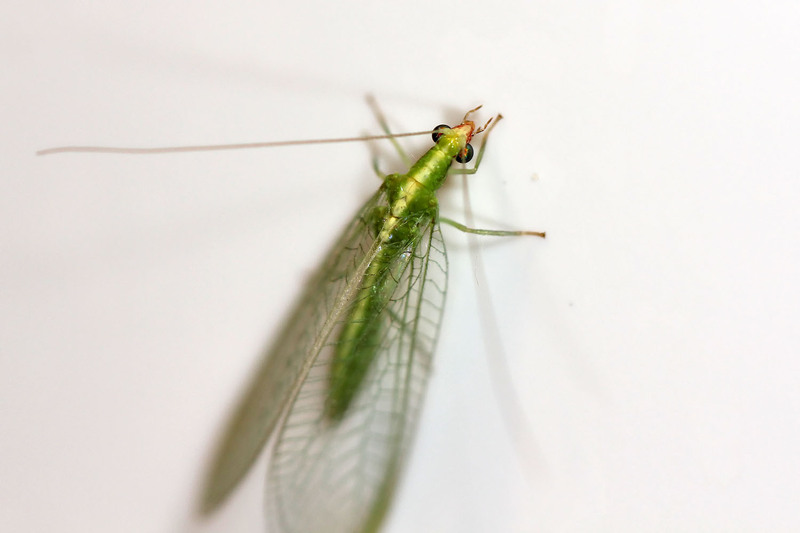 Nature's Archive Blog: Green Lacewing - In Our Refrigerator!? A few weeks ago I posted about a tiny egg that seemed to defy gravity. That was the egg of a Green Lacewing, a beneficial insect that often targets aphids as its meal. At that time I promised to follow up with some adult photos since these are so common in my yard. Well, the weather turned cold and several freezes, including some low 20's, all but eradicated the Green Lacewings from the yard. So I was surprised when I opened my refrigerator the other night to find one in the refrigerator! Of course, I took advantage of the opportunity and grabbed my camera and snapped a few photos. I wasn't thinking clearly and was in a rush (I was just stopping home for a few minutes while my wife and newborn were in the hospital). So depth of field and other fundamentals were thrown out the window, but I did manage one usable shot, albeit not with the depth of field I should have been able to get. For those interested in Macro photos, check out Macro Monday, which covers all things macros (not just nature). I would of snapped some photos of it too after I had a mini meltdown about it being in my fridge! The white fridge makes a good backdrop for it though! Good photo! Hilarious about the naturalist passion for a critter, even with the wife and newborn at the hospital! Funny post... love the irridescent greens in your green lacewing... great photo. A pretty little creature. Congrats on your new baby! Beautiful details of those iridescent wings!